What’s beautiful about Kindness is that it comes in all shapes and sizes. We don’t need any special qualifications, education, status, or resources to offer it…it’s all within US. We can be kind to friends and family, we can be kind to animals and the environment, we can be kind to strangers and we can be kind to ourselves. Good news…we’re all in! Let’s treat our souls, release some neurotransmitters, and teach our kiddos Kindness as a way of life. Start by prepping the base of your Kindness Tree. 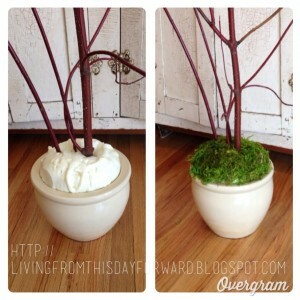 I saw this idea as a base for round wedding topiaries last fall and loved its versatility. I decided it would be a great display for the handmade hair accessories I make as part of my handmade line. First, add a layer of rocks to the bottom of the pot to help stabilize and prevent tipping, and to take up some of the extra space in the pot before adding the foam sealant. The sealant expands and hardens to fill the pot and hold the branches in place permanently. 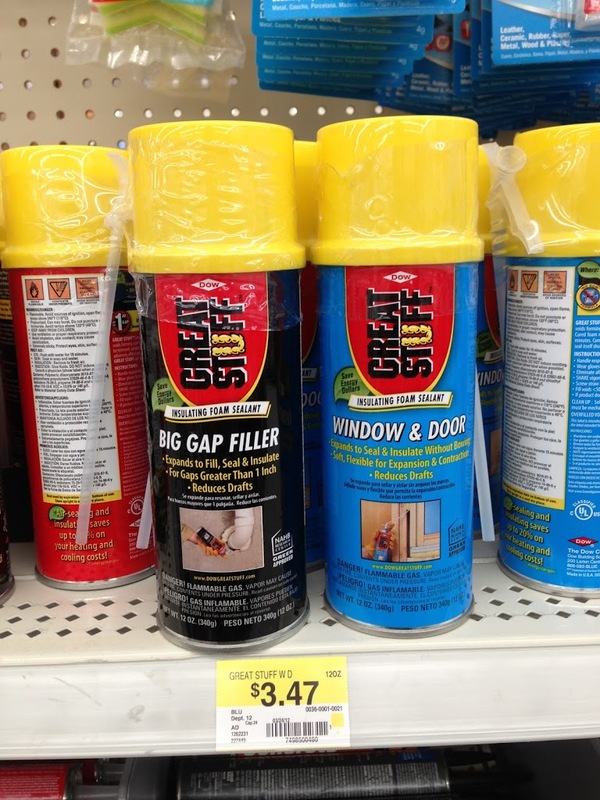 Carefully read the directions on the can of foam sealant, each is a little different. Trust the advice they offer about the estimated expansion of the product. They are not lying to you. If you don’t, your foam will take on a life of its own…I’ve heard. You may want to have a second set of hands (wouldn’t that be AMAZING?!) 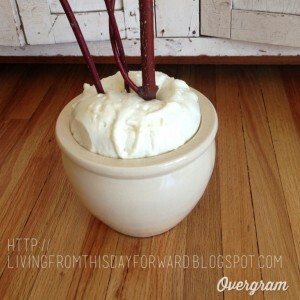 to help you position the branches in the pot as you add the foam and it begins to firm up. I set the pot on the floor next to a bench and propped the branches up again it to ensure they didn’t flop while drying. This is the expanding, insulating foam sealant. Cheap. Easy. Allow the foam to dry overnight and harden completely. Ours sprouted a large horn and we had to saw it off the following morning. The kiddos thoroughly enjoyed the production. *note: if you don’t have any lovely crimson dogwood branches on hand, and you’d like to add some flash, you could spray paint plain branches for a pop of color, although this is a bit more difficult if you are in a cold weather region like the current frozen tundra of MN! Please ventilate properly, people. It’s time to cover and decorate the foam at the top of the pot, if you wish. Glitter paint, felt, puff balls, dried moss, etc. 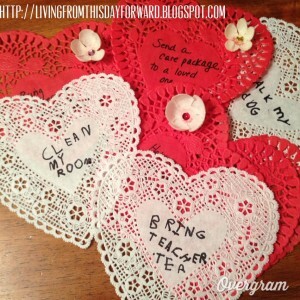 I found paper lace doily hearts at the big red bullseye store (dollar section – score!) but you could also have the kids cut our their own hearts. Remember folding a square of paper in half and tracing a half-heart for cutting? My kids still find that fascinating. You can also add embellishments such as flowers, gems, decorative paper inserts, etc. 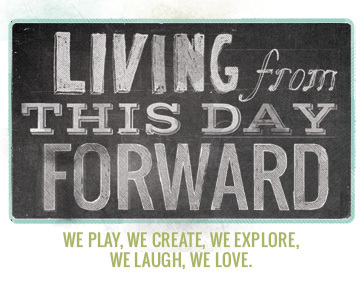 Now, this is when things get warm and fuzzy…it’s time to brainstorm acts of Kindness. 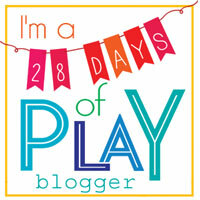 Offer your kiddos a few ideas to get their gears moving and see what they come up with from there! If they are learning to write have them help you add one kind act to each heart. You will be surprised by the innocence and magic of their ideas – melt. Remember, no act is to small! Make as many as you’d like. Now, decide how you want to spread the love…will you choose one act of Kindness a day from the tree to complete? Perhaps you’ll add the hearts as you complete the deed and ‘grow’ a bountiful bouquet? 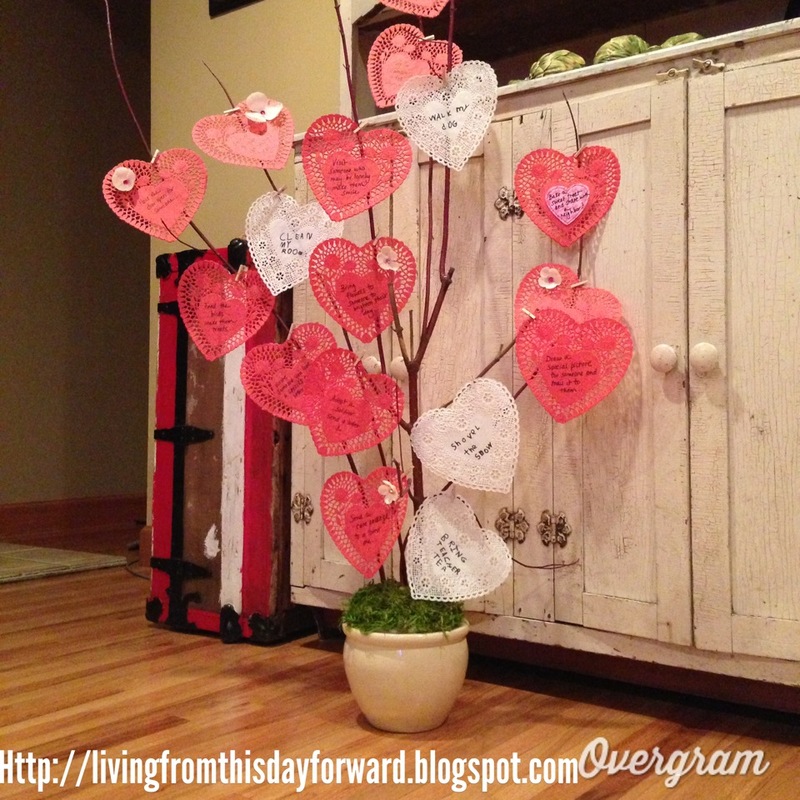 Your Kindness Tree will make a beautiful Valentine’s centerpiece and serve as a constant reminder to care. This list of ideas could have gone on for days…and you feel better inside just dreaming them up! 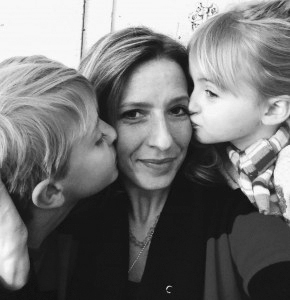 Clearly children respond to tangible reward, and there may be a time and place for that. THIS time let’s model the best form of Kindness – unrewarded kindness – let’s challenge them to embrace the type of reward that is not material, but felt on the inside, knowing that they’ve made a difference in someone’s life.